Is there room for two cooking, crafting and gardening experts at Majesco? 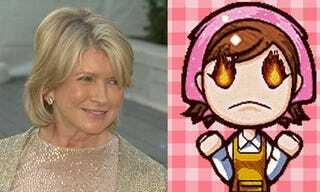 The U.S. publisher of the Cooking Mama series has signed a deal to produce video games based on America's favorite ex-convict, Martha Stewart. I smell a cat fight. One of the most powerful women in the world, Martha Stewart made her name delivering helpful tips on cooking, crafting, gardening, and securities fraud. One of the most powerful women in video games, Cooking Mama made her name delivering helpful tips on cooking, crafting, and gardening. So you see where there might be a conflict brewing, as Majesco Entertainment, the U.S. publisher of the Mama titles, signs an exclusive worldwide agreement with Martha Stewart Living Omnimedia, Inc. to publish games based on the lifestyle-content brand. Cooking Mama, while not an ex-con, has shown her more combative side in the past, notably when Activision tried to pass off Science Papa, a mini-game compilation of science projects for kids. Stewart is known for being somewhat controlling, though manages to sound genuinely excited about this new deal with Majesco. Sugar-coat it all you want; this is two powerful women with knives, aiming for the same target audience through the same video game publisher. This can only end in tears - tasteful, decorative tears.